Nobel Biocare developed a hybrid tooth replacement protocol that incorporates the latest of what CAD/CAM technology (computer aided design and engineering) offers and coupled it with the precision diagnostics generated by 3 Dimensional Imaging. The All-On-Four concept refers to a Nobel Biocare treatment protocol that incorporates the use of a proprietary implant placement guide that is used by Dr. Turner and his team to configure implant locations, depths and angulations that provide rock solid stability and anchoring. 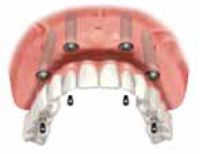 As the name suggest a complete full arch prosthesis can be fabricated with support from only 4 implants! The all on 4 technique is FDA and CE approved. It is especially good when available bone is inadequate and the posterior implants are placed tilted to achieve maximum bone support from the dense available bone. A panoramic X ray of a patient who has received the All on 4 implants procedure.